Training for Alaska – J.I.M. As winter approached, I was doing about 10 miles/week. My pre-marathon leg soreness had vanished, only to be replaced by a sore Achilles tendon. I stopped running for two weeks and increased my intake of Advil, but the swelling only came down slightly. 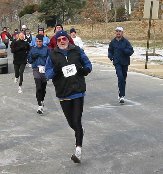 An old navy buddy in Maryland and my partner Greg were both interested in a 10 mile race in Wilmington in January, so I considered it as I cooled my heels with some sub-freezing 5 mile runs at Delcastle Park. By early January, I was feeling less pain while running, so on Wednesday before the race, I filled out the application before the fee went up an extra 5 bucks. But by then, my navy buddy had dropped out due to nagging injury. Not a problem, since Greg had been running every day and looked forward to it. Well, when I announced my entry to him that Thursday, he told me that he was out, since he had strained his calf muscle the previous morning! I had always thought of running as a pretty non-hazardous sport. Not by a long shot! They don’t call it “Icicle Run” for nothing! On Saturday night, I cooked myself a huge pasta dinner. Keep in mind that I only cook about once every 5 years. Scribbled some inspirational messages on my white ball cap, got some good sleep, stretched, and put my gear together. If it had been ten degrees warmer, I would have worn shorts, but with a race-time temperature of 20, my new wind suit got the call. The “magic gloves” purchased in Dublin matched perfectly. The car I followed off the ramp from I-95 had a licence plate reading “RACER”. And he thought he could intimidate me?! Did he not realize that I am Marathon Man? Actually, this reminded me that in brutal conditions such as these, you only see the serious runners. So for that reason, my goal was to finish halfway though the pack. Heck, it was still my rookie season! 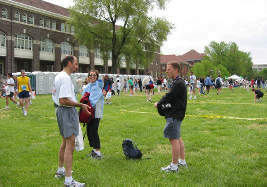 Ray gets together with Joe and Amy inside the YMCA prior to the race. Plenty of time to park down the street and pick up my T-shirt at the YMCA, which hosted the event. I felt like my fortunes were changing when I got “50” as my bib number. Soon, Amy and Joe arrived and Amy gave me the update on how the Disney Marathon went for the Joints in Motion group the week before. She started listing the injuries and soreness and I reminded her that I’d rather to hear the good news. Well, they all survived, but we had two DNF’s. See? A down-right hazardous sport! What a beautiful road, especially with everything covered by an inch of snow. The road was clear though, so at least I wasn’t concerned with breaking any bones. The river was to our right as we wound up the hillside. I maintained my position pretty well, but longed to reach the top for some level ground. Once there, we hit the 4.4 mile water stop for some ice-cold refreshment. I remained warm and bundled up in my lined windsuit and even my hands weren’t particularly cold. But another mile up the road we were greeted by some snow flurries whipping into our faces for a few minutes before hitting the turnaround. I felt a surge of energy, now knowing that most of the remainder of the race was downhill. It was also clear that I was better than midway through the pack and shouldn’t lose much ground as long as I kept moving. At 7 miles, I was still just under an 8 minute/mile pace. From the previous year’s results, I figured I needed about 8:15 for my goal of 50%. We re-traced our picturesque path along the river after grabbing another cold one at the water station. My main concern shifted to not being passed by too many runners of the female persuasion. Fortunately, the ones that did were attractive enough to inspire me to stay at their heels as long as possible. With one mile left, I was starting to feel jubilant. With a half mile left, I began to pick up my pace. With .3 miles left, we turned a corner and were greeted with the nastiest uphill climb I could imagine at that point in a race!!! It was about a block long, but I needed all my strength to keep my forward momentum. Think: trying to run in a nightmare. When I got to the top, I was so relieved that I missed a turn in the course and crossed Delaware Avenue in front of traffic before I came to my senses and sprinted back to the safety of the red cones. I got my kick going for the finish and then even jogged to my car to grab the camera again. One snap and it was time to enjoy some well-deserved pizza, bagels and bananas. An awesome brunch. I left my race time on my watch: 1 hour, 18 minutes, 28 seconds. My Achilles didn’t bother me, but would you like to meet “Paul” Bunion? 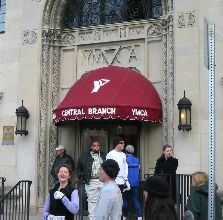 Check in at the Central YMCA – – – – – – – – – – Ray puts on the pressure! 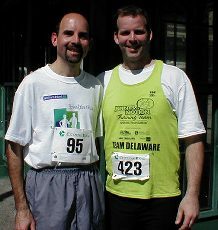 I dedicated this race to my friend Mike Eden, who passed away just 10 days prior. 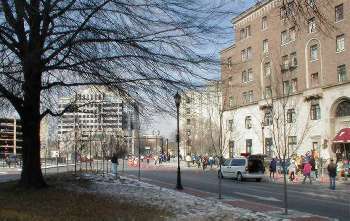 After a brutally cold and snowy winter, weather conditions were great. In fact, it was a little on the warm side on this sunny Sunday morning in downtown Wilmington. 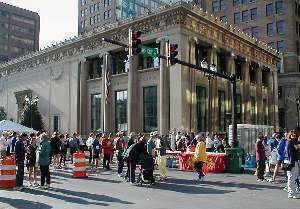 Over 1000 participants enjoyed this kick-off to the Spring running season. 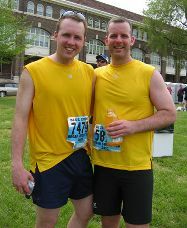 Two of my friends again bowed out in the weeks before the race. One was due to lack of time to prepare, due to the lousy winter. The other was injured [as usual]. I was happy to see both of my Joints in Motion coaches, Amy and Duncan. 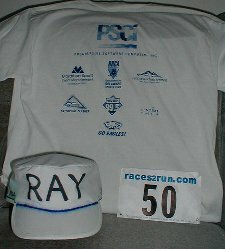 It was still chilly when I arrived at Rodney Square at about 7:40am to get my bib (#95), ankle band (timing device) and shirt. Time enough for some Gatorade and a potty stop before the 9am start. 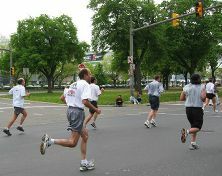 Senator Carper ran with us and vacated his position at the start line to join me in the middle of the pack. He was joking with the lady standing next to me when the gun sounded. 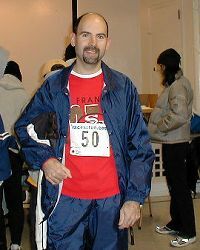 I didn’t run with anyone throughout the race, which started through downtown and around Frawley Stadium before heading back toward the Brandywine River. Except for that, the course was virtually identical to that of the Icicle Run, so in the first three miles, I tried to relax and not think about the long climb coming up along the river. The uphill wasn’t too bad, but I was relieved to hit the flat few miles approaching the turnaround point at an MBNA complex. I passed “Sponge-Bob”, one of our packers at QVC. he says he got the nickname since he sweats so much during runs. I told him I better not stay behind him! I could tell that I had gotten myself into the top 30% of the runners and knew that on the way down I should be able to maintain my position fairly well. Then there was the dreaded upgrade for the last half-mile into the finish. Good thing I’m tough as they come. Meanwhile, a now-shirtless Senator Carper was shaking hands with runners as they departed the finish area. I must have beaten him, since I had to go over afterwards to greet him. 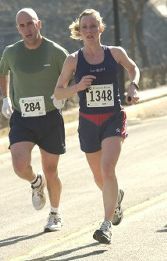 Coach Amy had finished in 3rd place in her division (59 total) and 8th place among 336 women overall! Boston awaits her. Senator Carper finished in 446th place (15th of 39 in his M55-60 division). 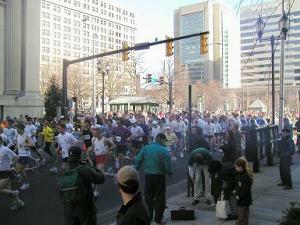 The Second Largest Ten-Miler in the USA. 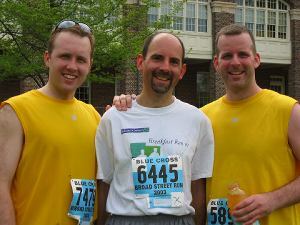 The Blue Cross Broad Street Run is conducted by the Philadelphia Department of Recreation, and sponsored in part by Independence Blue Cross and the Philadelphia Daily News. Sponsorship and pledge money benefits the American Cancer Society. 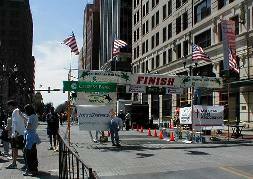 The 10 mile point-to-point course runs past the varied neighborhoods of Philadelphia along Broad Street. It runs through the heart of the city and finishes at the Philadelphia Naval Business Center in South Philly. With the coming of Spring, I was determined to get in enough training to put on a good showing. 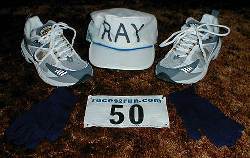 On each of the two weeks prior to the race, I got long runs of over 10 miles, without significant strain or soreness. Three days prior, I set a PR (personal record) in my standard training run of 3 laps at Delcastle park, so I was feeling good! I rode up to Philly with Duncan (who picked up my race packet) and his buddy Ed. Weather conditions were near perfect (upper 50’s and overcast). We parked at the First Union Sports complex (Veteran’s Stadium, F.U. Center, F.U. Spectrum, and the new football and baseball stadiums under construction). 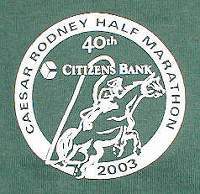 we had ample time to board SEPTA (Philly’s subway) along with 10,000 other runners for the ride north to the starting line. A subway car full of people in running gear is quite a sight, especially when the adrenelin (and Gatorade) are flowing. Duncan, Ed and I dropped off our bags on designated busses that would meet us at the finish. We headed to the 7 minute pace sign to make sure we didn’t get stuck behind too many slow runners. At 8:30am the race started down the pleasantly flat course. 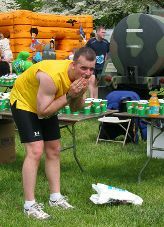 There were water stations nearly every mile, and handfulls of onlookers clapping (or grimacing if they meant to cross the street). At one intersection where a cop was waving cars to turn instead of crossing Broad, a motorist was pleading and yelling to let her cross since she was late to work. That made me chuckle. At another intersection, I nearly ran into a pedestrian who was being hurriedly escorted across the street by another police officer. Not an easy task in the midst of 10,000 runners. 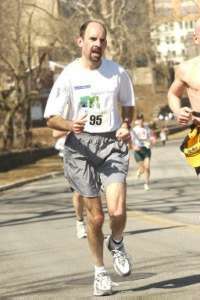 I maintained a good steady pace throughout the race, and felt strong. We passed Temple University and continued through the downtown area. 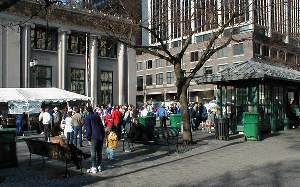 A couple small bands played on the sidewalk. Farther down, a solitary drummer helped us along with a fast beat. As we were approaching the Sports Complex, not suprisingly, the theme from ‘Rocky’ inspired us. 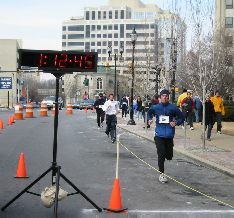 Over the last mile, I still had a good kick, and the crowds of spectators helped bring me home to a satisfying finish. Now it was chow time!!! When I checked my results online, I was delighted to find that I placed in the top 16% overall, the top 22% of men, and the top 25% of my division! Running this spring meant running in the rain. I’d switch between wearing my old hall of fame 1121 shoes (of Dublin glory) on wet runs and the lighter 715’s on dry days. Trail running was out of the question for quite some time. Again, most of my running is alone since I can decide when to go on a moment’s notice. In May, I finally joined Pike Creek Valley Running Club and started attending their Thursday evening runs at Delcastle. It’s great to meet so many veteran marathoners! And my training has been given a boost by trying to keep up with the speedier runners. Arthritis Foundation decided to combine their Delaware Chapter with the Eastern PA Chapter this spring, so I’d be joining the large “EPA” group of 80 athletes! 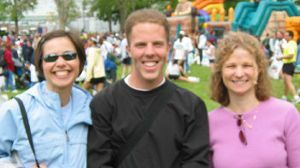 Coach Amy Blithe would remain a resource for Delaware participants. 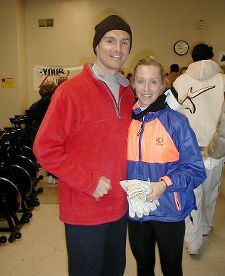 She trained hard all winter to run the 2003 Boston Marathon and did so in warm conditions. Congratulations to Amy for finishing in the top 2% of female runners!! !